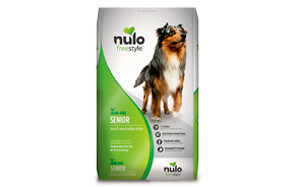 Known for its Freestyle range of pet nutrition, Nulo dog food is a brand that is not really popular yet is largely considered as having one of the most protein-rich and nutrient-dense formulations in the market. A Nulo dog food review is never complete without highlighting a handful of the brand’s best features including protein-rich dog nutrition, low-carbs, patented probiotic formulation, grain-free, and chicken-free dog diets that can surely appeal to pet parents who are already wary about allergenic proteins. It’s pricier than most, though. But if it’s in your pet’s best interest, then why not? This Nulo dog food review will try to underscore some of the things that make this brand of pet food worthy of your attention. The taste of grass-fed lamb mixed with a sumptuous blend of salmon and turkey makes this Nulo grain free dog food quite a mouthful for your growing hound. More than 80% of the proteins in the Nulo dog food ingredients come from these 3 real meat ingredients. It’s got the right mix of vitamins and minerals including zinc, iron, calcium, and phosphorus to maintain the optimum functioning of your dog’s immune system, blood, bones, and joints. This Nulo dog food also comes with a 5:1 ratio of the essential fatty acids which work well with the included Bacillus coagulans species of probiotics for optimum digestion and immune system health. You won’t see any allergenic proteins or grains in this formula. Instead, it’s a nice blend of wholesome lentils mixed with healthy fruits and vegetables to make sure your pet’s optimum development proceeds as nature designed. Your aging hound should never be given scraps. It has served you all its life and now’s the perfect time to show your appreciation with this Nulo senior dog food that features two of the healthiest fishes on the planet – trout and salmon. The addition of turkey should make each bite of this kibble formulation tastier and more meaningful for your aging dog. It’s got chondroitin and glucosamine to retain the full functionality and range of motion of your dog’s joints. Amino acids, essential fatty acids, vitamins, and minerals like calcium and phosphorus are also in their right amounts for the elderly dog. The choice of Nulo dog food ingredients helps provide for easier digestion, allowing your senior dog to enjoy more of its food. 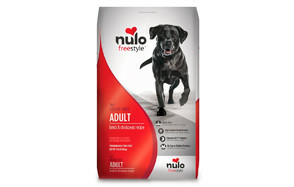 Give your old dog the best nutrition it deserves with this Nulo grain free dog food formulation. Dogs that are prone to obesity or are already gaining weight should be exercised and placed on a weight management diet. Good thing Nulo grain free dog food has just the right diet for such a purpose. Utilizing the lean meats from cod, salmon, and turkey this Cod & Lentils recipe for dogs is sure to get your pet achieving its desired weight in no time. It has lower calories and fat content than other Nulo dog food formulations allowing your dog to take in only the right amounts of calories for its activity level. The formula also features l-carnitine, an amino acid known for its performance-enhancing and fat-burning properties. There are also essential fatty acids as well as probiotics to help improve digestion which can further aid in managing your pet’s weight. This Freestyle formula is perfect if you want your pet to stay trim and fit. Puppies are very energetic, highly rambunctious, and very eager to learn their new world. As such, you’ll need to give them extra energy, more proteins, and better means to develop their brains, cardiac and digestive systems, immune functioning, and bones and muscles. That’s what this Nulo puppy food is all about. Featuring a unique formulation of salmon, turkey, and menhaden fish you can feel more secure knowing that your young pet’s brain and eye development will proceed as nature intends it to be. More than 80% of the proteins in this Nulo grain free dog formula come from salmon and menhaden fish, giving your dog exceptional levels of DHA and EPA. The addition of fruits and vegetables also help support the development of a healthier immune system. It’s the best diet you can feed to a young and developing puppy. Unlike other canned dog food that use water as their first ingredient, the Nulo canned dog food uses real high quality meat as its top ingredient. In this turkey rendition of a wet Nulo dog food, your dog will be treated to the delicious taste of turkey meat and liver lathered in an equally rich and savory turkey broth. There are only three other ingredients added to the mix, giving your pet one of the finest delicacies in town. It can be served as a delicious meal for your sick dog, puppy, or senior hound, or it can be used as an appetizer for your pet’s dry dog food. However you wish to feed the Freestyle Turkey & Sweet Potato to your pet you can be sure that its amazing array of essential amino acids, essential fatty acids, minerals, vitamins, and probiotics will get your dog up to speed in terms of its development. The story of Nulo is one of dedication and commitment by a loving pet parent to provide his beloved pet with only the best. After careful analysis of the pet food brands available in the market, the corporate guy-turned pet care enthusiast and business owner found that more and more pets are getting overweight because of the preponderance of pet food that were filled with more than 40% fillers. Additionally, some so-called high-protein dog foods actually contain more plant-based proteins than meat- or animal-based proteins. As such, he sought to change all that by forming Nulo. 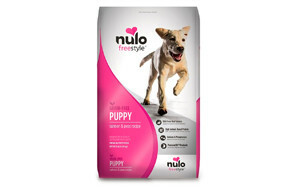 Nulo as a dog food brand emphasizes animal-based proteins as the foundation of good canine nutrition. The brand works with leading veterinarians, clinical animal nutritionists, and food formulators to come up with recipes that put primacy to animal-based proteins while also adding low-glycemic and non-allergenic ingredients into the mix. The result is a dog food that is not only complete and well-balanced, but also provides stable energy source, rich supply of easily digestible animal-based proteins, and none of the worrisome allergens. The brand is based in Austin, Texas and is growing strong. The brand strongly espouses three fundamental principles: high animal-based proteins, low carbs and glycemic ingredients, and rich in probiotics. It is this 3-pronged approach to canine nutrition that Nulo is bound to create a strong following. If you want to give your pet dog food that comes with high-quality, hypoallergenic animal-based protein as its principal ingredient, the Nulo dog food is definitely for your pet. The brand always strives to emphasize the primacy of animal meats as the foundation of optimum dog nutrition. This helps ensure that your dog gets the best possible and most complete mix of essential amino acids and essential fatty acids to support its growth and development needs. If you want a dog food that is free from chicken, soy, corn, wheat, other allergenic ingredients as well as high glycemic ingredients, then Nulo is definitely your brand. Its formulations do not contain these ingredients making sure your pet has a safer, gentler tummy and healthier skin, coat, and digestive system. Its metabolism will also be more stable, allowing it to maintain its ideal body weight regardless o its activity levels. Pet parents who believe in the importance of probiotics in the enhancement of digestive and immune system functioning, then Nulo is your pet food. It features its patented GanedenBC30 probiotic formula that includes about 80 million CFUs of healthy strains of probiotics into each dog food formulation. It’s your way of taking care of your pet’s immune system and optimum digestion. Without a doubt Nulo dog food deserves the right to be called one of the best. However, it would be unjust for us to make such statements without making some strong points for the brand. Here’s what we have found out looking at and analyzing the Nulo dog food ingredients. On the average, Nulo comes in with a crude protein content of about 30% for its dry food varieties and 10% for its canned or wet versions. When the moisture content of these formulations is taken into consideration, the dry food formula will come out with 33.33% protein on a dry weight basis. Its canned version, on the other hand, will come up with 45.45% protein content on a dry weight basis. When compared with other specialty brands you may find that Nulo is at par with some of them, although there are definitely other products that provide a much better proportion of proteins than Nulo does. However, this isn’t the end of the story. As one of the principal reasons for establishing the company, more than 80% of Nulo’s proteins come from animal meats and other animal-based ingredients. We have seen products with substantially higher protein contents than Nulo’s but more than 50% of the proteins in these products are actually sourced from plant ingredients. Again, we don’t have anything against plants as ingredients. We just don’t necessarily believe that they can provide the most complete range of essential amino acids that are critical to a dog’s optimum development. That being said, while it is true that Nulo’s protein content may pale in comparison to other high-protein dog diets, you can be sure that its proteins are from animal sources. Another point worth mentioning is that the brand always names its ingredients especially its proteins. Nowhere on the label will one can see vague terms such as “animal” or “meat” or even “poultry”. The brand doesn’t hide the ingredients that it uses. On that note, it doesn’t even include chicken in its formulations. Everyone talks about food allergies. Unfortunately, many overlook the fact that beef and chicken are two of the most allergenic proteins in the land. Substituting this with turkey, salmon, trout, and menhaden fish among others is something noteworthy of the brand. Averaging the 4 dry dog food products of Nulo in this list, we can come up with an average fat content of 13.25% while its canned version comes in with 6%. This can be adjusted to account for moisture leading to a dry weight protein content of 14.7% for the dry dog food formulas and 27.3% for the canned variety. If one takes a look at the dry dog formulation, it is well below the 18 to 20 percent range of most dry dog food brands. This can be attributed to the brand’s choice of leaner meats like turkey, trout, and salmon as its principal ingredients. Since animal ingredients typically contain both proteins and fats, the denser the muscles the lesser is the fat content. However, one should also take a look at what salmon and the other ocean fishes bring to the mix. These are rich in omega-3 fatty acids which can help in the enhancement of a variety of physiologic processes in the dog’s body. Considering the protein and fat content of Nulo dry dog food varieties, we can compute for its carbohydrate content on a dry matter basis as 42.3%. For its canned version, carbs only constitute about 27.25% of the ingredients. Overall, one can say that Nulo dog food contains low to moderate amounts of carbs. The best part of this is that it never uses high glycemic and allergenic ingredients such as wheat, soy, and corn. It also does away with a lot of fillers. For instance, its Lamb & Chickpeas recipe only contains chickpeas, yellow peas, and sweet potato as the added ingredients although there are additional fruits in minimal amounts. Whenever appropriate, Nulo dog food makes sure that the formula contains other micronutrients and nutraceuticals needed to effect a desired change in the dog’s physiology. For example, l-carnitine is highlighted in weight management diets while chondroitin and glucosamine are fortified in formulas for seniors and other dog conditions that require strengthening of the joints. DHA and EPA are also great for puppies. One thing is certain, Nulo more than complies with the requirements of AAFCO; it exceeds them. Nulo dog food is a high protein, moderate-calorie, low-carb formulation that takes into consideration the unique developmental stages of dogs. It doesn’t use chicken as well as any of the allergenic grains that many pet parents are worried of. Despite its hefty price tag, Nulo dog food makes for a great diet to feed to modern pets.